A simple, easy-to-use jQuery plugin to make quotes from your articles shareable via email in an elegant, meaningful way. SVG vector icon ready for retina displays. Simply wrap any passage from your content in a span with a class of tweetable, and the user will be able to click that passage and directly share it with their friends and colleagues via email. 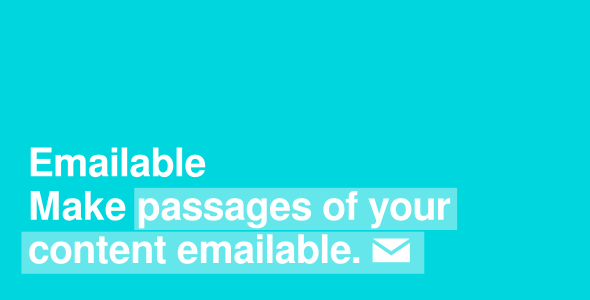 Include a custom subject line, a url and additional body text to make it easy for your users to spread your content! Grunt setup, Sass files, package.json included for advanced users.